Research indicates that mindfulness can improve leadership productivity, creativity and capability. It encourages you to take better care of yourself, balancing must-do work activities with things that invigorate and nourish you at a deep level and increasing balance, perspective and fitness to lead whilst maintaining or improving productivity. 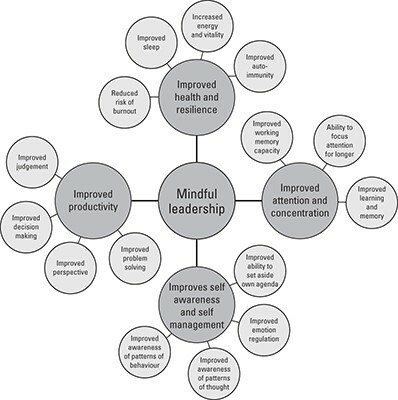 Mindful leadership, simply described, is good leadership + mindfulness. Mindfulness can be defined as ‘the cultivation of metacognition (awareness of thoughts, emotions and sensations) to help you maintain an optimum mind state (open, calm, optimistic, energised)’. When you are open, calm, optimistic and energised, you maximise your brain’s ability to function at its peak, which in turn helps you to be the best leader you can be. This may sound deceptively simple, but remaining calm, open and energised when under pressure is a skill that needs conscious cultivation. The good news is that with a little time and effort, you can develop this skill. Attending taught workplace-focused mindfulness programmes, like WorkplaceMT, help you develop valuable skills to survive and thrive, whatever life throws at you. Programmes like WorkplaceMT harness the power of neuroplasticity (your brain’s ability to reorganise itself by forming new neural connections throughout your life) to help you hardwire into your brain new ways of approaching, exploring and responding to life. For this reason, mindfulness training programmes are normally six to eight weeks in duration, as this duration is necessary to implement the changes you desire into your brain. Research illustrates that mindfulness can improve health and resilience, attention and concentration, self-awareness and management, and productivity. 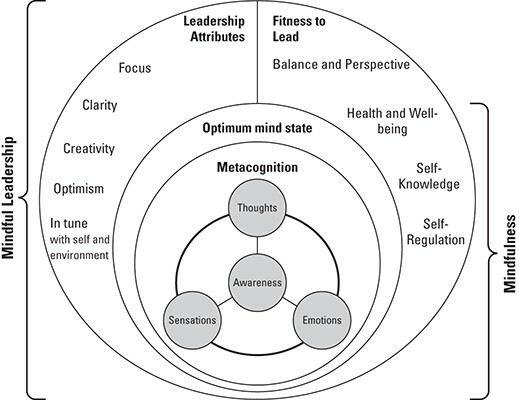 This diagram illustrates further the four key ways that mindfulness can help you to improve your leadership. Mindful leaders are self-aware. Awareness of your thoughts, emotions and impulses enables you to gain perspective by breaking out of autopilot and habitual behaviours. Mindful leaders are in tune with themselves, the environment and culture they work within and the people who work there. Mindful leaders cultivate focus, clarity, creativity and optimism. Mindful leaders build trust and support from their followers by balancing the needs of the organisation with the needs and aspirations of people.